On Monday, July 24, President Rodrigo Duterte will deliver his second State of the Nation Address — an opportunity for him to boast about his accomplishments during his first year in office, as well as to lay out his plans for the remainder of his term. “Expect po natin na talaga namang magiging meaningful ang SONA na ito sapagkat hindi po technical, di tulad ng last SONA na technical. Ngayon po ay talagang ang mga proyektong naramdaman ng mga beneficiaries ang mababanggit dito sa SONA,” Andanar said. In our MNP SONA Poll last year, CNN Philippines and the ABS-CBN News Channel were the top choices among our readers, earning rave reviews for their "concise and in-depth" coverages. Like in the previous years, we are again asking you to participate in our online poll. 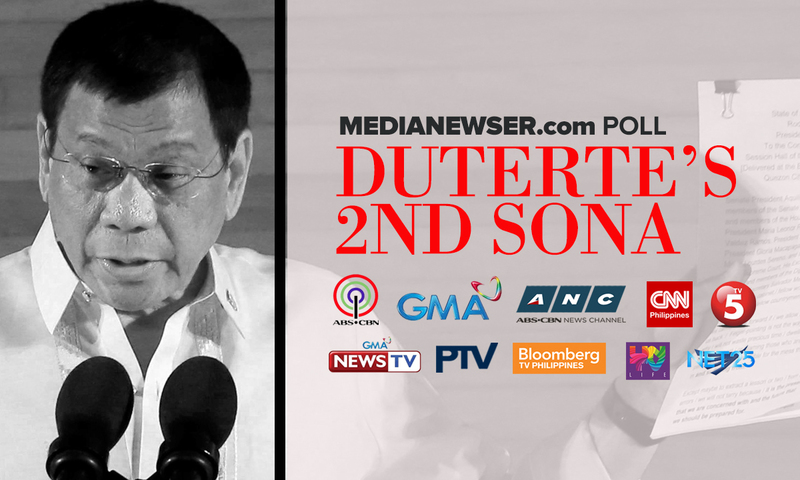 Let us know where on TV do you plan to watch the 2nd SONA of President Duterte. Cast your vote and leave us your comments below, and participate in the discussion on our Facebook page. You can also tweet us @medianewserphil. We'll keep this poll open until the evening of July 24.